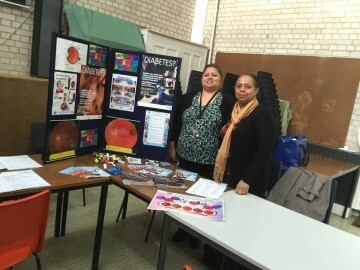 Our team have attended several awareness events in the Walsall area over the previous months. Palfrey Girl’s School in Walsall invited us to give an educational talk on November 18th to two groups of their students, ranging from age 11-16, which was a great success. November 25th saw us attending a GP Training event and presenting to many GP’s and practice nurses about the importance of eye screening for patients with diabetes. The picture shown in from an Asian Women’s Mental Health Support Group event, which our staff members attended on February 2nd in Birchills, Walsall. These events have all been well received by healthcare professionals and the public, increasing awareness of the service we provide for Walsall and all of the West Midlands. Many thanks to our dedicated staff for attending these events and taking the time out of their busy schedules to engage with the public and try and improve outcomes in our communities.